Nine proposals have been submitted by Florida Tech, Harvard-MIT Division of Health Sciences and Technology, Universities Space Research Association, Embry-Riddle Aeronautical University, University of Alabama at Birmingham, College of Menominee Nation, University of Texas Health Science Center, Duke University Medical Center, and University of Alabama in Huntsville. The press release gives an overview of the 9 proposals. More details about these proposals can be found on the Proposal Summaries page. Junior electrical and computer engineering student Ross Finman was awarded the Robert H. Goddard Memorial Scholarship, a scholarship issued by the National Space Club that is given to a student interested in space-related science and engineering. Finman explained that he had been interested in space technology since he was 12 years old and received his first Lego Mindstorms kit, which he used to build robots until his fingers bled. Finman is involved in a number of activities that go along with his interests in space technology. He has participated in the Google Lunar X-Prize, which is a $20 million competition where teams compete to send a robot to the moon and send images of the moon back to Earth, and is also working on the NASA Regolith Excavation challenge dealing with obtaining dirt from the moon. “The Google Lunar X-Prize team has taught me more in two years than I could have imagined in my entire educational career,” Finman said. Topic: Discussion on the NSS Team efforts and the Space Elevator. Bert has 30 years experience working at Lockheed Martin. An interview with Peter Diamandis, a slide show, updates from the PIAXP team itself, and news on Aptera, Avion, Global-E, Lightning Hybrids (pictured), Linc-Volt and Myers Motors. Plus more. Where are they Now? 9 Auto X Prize Team Updates - Popular Mechanics - I liked this Fuel Vapor Technologies quote enough to pick their image from this article: We want to make gasoline a condiment,” said Todd Pratt, head of business operations for FVT. You'll see several more Automotive X PRIZE articles on the "X PRIZE Press" scrolling display at the X PRIZE Foundation main site. It’s science contest season! - Science Geek Girl - A number of student contests in areas like Physics, Rocketry, Chemistry, Science Communication, and Science Photography are overviewed. Meanwhile, Kiki 2 Space has started a new website. The CAFE Foundation is very pleased to offer a new array of important reports on extreme body drag reduction in its PAV Technology Library. These reports include work on Goldschmied propulsion that should prove valuable to any team planning to compete in the NASA Centennial Challenge flight competition. Micro-greenhouse on the Moon - RLV News - This post has the latest news on the morning of the Odyssey Moon/Paragon Space lunar greenhouse press conference. I'll try to update this post this evening with any information I come across on the press conference itself. This reminds me of Gene Wolfe's Book of the New Sun series set so far in the future that it reads like a fantasy, where "the moon has been made verdant and now shines green in the sky". The most significant difference between this rule set and the one for 2008 is that we have opened the solution space to telerobotic operations. This doesn’t mean the teams get to operate their excavators like RC cars. The operator will be isolated from the excavator, will only be able to receive data collected by the excavator itself, and a realistic time delay of all signals passing from the operator to the excavator is required, making for a reasonable lunar robotic operations analog. Teams who have already developed autonomous capabilities will still benefit from those, freeing up the operator to pay attention to higher level tasks or to apply resources toward further optimizing their excavation efforts. Completely autonomous operations require an extremely high level of integration, and it was decided that this was taking too much focus away from the actual excavation task. Effectively, power consumption is now limited by the excavator’s mass because it now must carry it’s own power. This relieves the teams from having to integrate their systems with a ramp and power source provided by the competition organizer. This also introduces a real NASA requirement for excavation systems; the need to deposit regolith into a hopper that rises two feet above the surface. Hardware mass limit) from a supplied quantity of regolith within a specified Time Limit will win the CHALLENGE and are eligible to receive First, Second or Third Prize of US$500,000.00, US$150,000.00 and US$100,000.00, respectively. There are some rules about what not to do: no ordance is allowed, no accumulating regolith by pushing it against the walls, no using the bottom of the Sandbox as a support, etc. 9:00 Monroe King, N-Prize Contestant: Team Prometheus/Aeronautic Enterprises Inc.
That's just a sampling of the program; see the above link for the rest of the schedule. There are a lot more that sound interesting; for example, "NASA Ames Human Tended Suborbital Science/Yvonne Cagle and Bruce Pittman". Here's a link to the NASA Ames SUBORBITAL EX site (EX standing for EXperiences, EXperiments, and EXplorations). Irene Klotz noted a couple months ago about some preliminary human-tended suborbital science proposals being reviewed by NASA that "... a decision about which projects will receive funding for additional study is expected around March." PICK A MARS ROVER'S NAME - Cosmic Log - Here's your chance to decide what NASA's next Mars rover will be named - and send your own name along for the ride. P.S. : Stephen Colbert doesn't get a write-in vote on this one. Nancy Conrad and Josh Neubert of The Conrad Foundation return to discuss the upcoming Conrad Foundation awards. For those wondering about telerobotic concept: Excavator operators will be isolated from the excavator so no 3rd person data. @Amy_Cheng You can expect to see the rules by early next week. Making progress on the new rules document. Received feedback from NASA ISRU, and incorporating that now. Aiming to be more user friendly. Interorbital Systems - SYNERGY MOON at Google Lunar X PRIZE Teams site - The video gives an overview of Interorbital Systems, part of SYNERGY MOON. It also includes some cool Mojave scenery for when the computer work and welding is done for the day. Oddly enough, this one doesn't appear on the "Teams" page "Latest Team Announcements" list for March 20, but it's on the main page and the SYNERGY MOON page. ARCA Stabilo engine tests completed successfully - ARCA at Google Lunar X PRIZE Teams site - Two videos are included. Also see ARCA engine test videos (RLV News) for links to more new ARCA material. ... 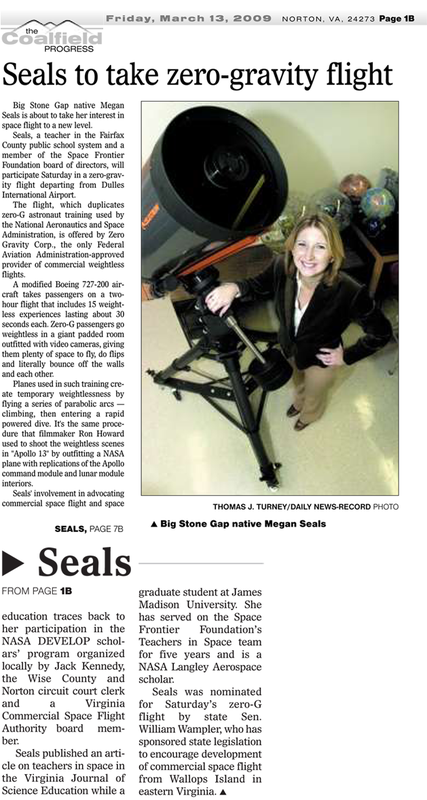 While planning to tout ZeroGravity flights in Virginia, Seals got an unexpected honor from her native Wise County with a dedication of $1,000 to offset the $5,000 costs of the next teacher-to-zerogravity flight comeptition to be sponsored by the Southwestern Virginia Technology Council. Wise County specifically donated the money to honor Seals. A competition will be held among the southwestern Virginia public school teachers to fly later this year. A significant part of the selection process will be based upon the merit of the zerogravity student experiement designed with the teacher's classroom students. The Teachers-in-Space Team of the Space Frontier Foundation will assist in the selection process. ... Soon the firm was re-named BlastOff Corporation (from Spacelab!) and in just six months or so we had 50 employees, a baseline mission and system design, a rocket on order and a huge head of steam. Sadly, the dot-com bubble began to pop in late 2000 and the entire BlastOff effort came to a screeching halt ... The onboard RocketCam™ video from SpaceShipOne during its two Ansari XPRIZE flights also gave us quite a boost–globally. ... Within the first two days after the GLXP was announced in September 2007, I got calls from four different team leaders (all of whom I knew already) asking about whether Ecliptic could supply their team with onboard imaging systems. That sort of brand validation was very satisfying, to say the least! ... I registered Ecliptic as a “stealth” team at the end of 2007, with the notion that we’d participate for as long as it took to figure out how many other teams were competing and which ones we’d prefer to be part of. ... Now, Ecliptic is still a candidate supplier to several GLXP teams, and we’ve also covered the costs of filing the patent for the SCSG spinning lander/hopper concept and will control this intellectual property from now on. Ecliptic has no plans to field a GLXP team on its own. The 2009 NASA Great Moonbuggy Race at the U.S. Space and Rocket Center in Huntsville, Alabama approaches. The dates are April 3-4, 2009. The Praxis Inc Battle of the Rockets - Spring Competition is scheduled for April 4, 2009 in Culpeper, Virginia. The categories are the "Mars Lander" CanSat-like competition, and an altitude competition. The Lessons That Count contest gives you the opportunity to share your formula for creating and delivering successful, interactive math lessons. By entering this contest, you could win a SMART Board 600i interactive whiteboard system. The Conrad Awards Team Blogs site remains very active. High-flying challenge - Denton High students prepare for national rocketry competition - Denton Record-Chronicle - The rocketry competition is the Team America Rocketry Challenge. More than 9,000 students in kindergarten through 12th grades submitted essays proposing names for the rover in a nationwide contest that ended Jan. 25. Entries came from all 50 states, Puerto Rico and the families of American service personnel overseas. NASA will select the winning name, based on a student's essay and the public poll, and announce the name in April. The Annual Global Technology Symposium will be held March 26-27 at the Arrillaga Alumi Center at Stanford University. This year's theme is "Entrepreneurship and Investment in a Turbulent Economy." The Symposium is the premier investor conference focused on technology and growth companies in Silicon Valley, BRIC countries, and other emerging markets. It brings selected international leaders in business, finance, politics, and technology together to discuss how entrepreneurs and blue-chip companies alike can seize the opportunities of globalization. NSS members will receive a special $50.00 discount off the standard registration price. Please email info@globaltechsymposium.com and mention that YOU are an NSS member for your special discount. This year the Global Technology Symposium will be hosting a start-up pitch competition for early stage companies looking for professional financing from sophisticated investors. The presentation provides companies with a chance to pitch their business ideas and receive valuable feedback from a panel comprised of successful venture capitalists from all over the globe. The Robot Club of Traverse City, MI news letter is available free for anyone interested in robots or robotics at http://tech.groups.yahoo.com/group/robotcluboftraversecitymi/. The Robot Club of Traverse City, MI met Saturday 3/14/2009 at the AIM workshop at 390 4-Mile Rd. S., Traverse City, MI 49686 from 1 pm to 2 pm. Rich Core from the Google Lunar X-Prize Team FREDNET brought us up to date on the teams progress toward a Moon landing. First test of the JSEA Balloon-Tether competition track is successful - Space Elevator Blog - The has post a bunch more pictures, and good news about the competition. First, when Google announced the release of the Ancient Rome in 3D collection, they also announced a competition for K-12 educators in the US to come up with the best lesson plan involved the Ancient Rome collection. Yesterday, Google announced six winners of this competition. Entries need to be sent in by June 15, noon PST. They will be judged using criteria like accuracy, low polygon count, and detail. Here's the digital poster (PDF) for the competition. Under Dr. Soon-Shiong’s direction, the GSC will steer the direction of future Life Science related X PRIZEs to ensure that they address the audacious grand challenges where market failures currently exist. The Life Sciences GSC will address such subjects as healthcare, genomics, proteonomics, bionics/human augmentation, rapid disease detection, disease prevention, human longevity and artificial intelligence in medical diagnosis. Several others are in development, including a Healthcare X PRIZE in partnership with WellPoint Inc., one of the nation’s largest health benefits companies. Other potential prizes include: point-of-care tuberculosis diagnosis, bionics and vision restoration. Life Sciences currently represents the Foundation’s most active portfolio of prize development. KML Research Winners - Google announced the winners of their contest for the best cases of using KML for Research. Each winner will receive a prize pack including an iPod Touch, Garmin GPS, and Google swag. All entries will appear in the Google Earth Gallery. Bjorn Sandvik, who has appeared in GEB several times, was one of the winners and has shared his winning entry. My dissertation, Using KML for Thematic Mapping, was also awarded the MSc Dissertation Prize at University of Edinburgh. Although not on prizes, this Google Earth Blog post will be of particular interest to readers here for space topics: Google Earth Mars Update - Live Imagery from Another Planet. A number of new data layers have been added. NASA Ames continues to be at the forefront of innovation. Check out the post so you know specifically what to look for. HAMPTON, Va. - Fifteen teams have made it to the finals of a NASA and National Institute of Aerospace (NIA) sponsored competition that challenged university students to think about the conditions astronauts will face when we return to the moon, then design projects that could become part of real lunar exploration. The undergraduate and graduate engineering students won the right to compete against each other at the 2009 Revolutionary Aerospace Systems Concepts Academic Linkage or RASC-AL forum to be held in Cocoa Beach, Fla., June 1-4. Anousheh Ansari will be appearing at the following upcoming events and locations. The Innovation Partnerships Office at NASA’s Johnson Space Center has announced the addition of three separate $20,000 awards to one already granted, bringing the total to $80,000, to be presented as part of the 2009 Rice University Business Plan Competition. The three new prizes will be awarded for the best business plans representing an engineering technology that has applications to both the NASA space program and to earth-based activities, according to Michele Brekke, director of the JSC Innovation Partnerships Office (IPO). Mojave Air and Space Port thriving - Aerotech News (link from X PRIZE Foundation) - The article covers a number of former and current space prize teams, including Ansari X PRIZE winner Scaled Composites, Lunar Lander Challenge team Masten Space Systems, and Interorbital Research, member of Google Lunar X PRIZE team Synergy Moon. eSpaceTickets.com is also mentioned in the context of Synergy Moon. CRASHING GALAXIES WIN CONTEST - Cosmic Log - The people have spoken, and that means the tangled-up group of galaxies known as Arp 274 will get an exclusive photo shoot with the Hubble Space Telescope. The interacting galaxies won almost half of the 139,944 votes cast in the Hubble team's first-ever "People's Choice" ballot. The Space Show this week - Space for All - Sunday, March 15, 2009, 12-1:30 PM PDT: Dr. Paul Dear returns to the program to update us on new developments with his N-Prize program. PAUL JANSEN - Partner, McKinsey & Company - McKinsey & Company will present the findings of its recent research report, "And the winner is ...": Capturing the Promise of Philanthropic Prizes. The report responds to the recent surge in interest in philanthropic prizes by examining their potential as instruments of philanthropy and by profiling current practices in their design and delivery, drawing lessons from the social, public and private sectors. The session will discuss the recent renaissance in prizes, identify a number of ways in which they can be distinctive instruments for producing social benefit, and review interesting practices in their effective design and delivery. Finally, the session will discuss the potential future of prizes, and how each industry can invest to support it. Prizes for philanthropic-minded efforts are increasing not only in their number, but also in the size of the cash awards they convey, and are being applied by an ever-expanding list of sponsors to a broader range of issues than in the past. But the report, issued by McKinsey & Company’s Social Sector Office, warns that this growth has also resulted in “many overlapping prizes and growing clutter,” and that quantity doesn’t always signal quality. Here's the paper: "And the winner is ..." - Capturing the promise of philanthropic prizes (PDF). I haven't had a chance to read it - I just saw it today and it's 124 pages. Skimming it, I do see some coverage of space prizes and acknowledgement of interviews of space prize personalities like Doug Comstock, Ken Davidian, and Andrew Petro. Here's the conference web site: incentive2innovate. The conference covers the innovation prize model and related innovation practices like open source and crowdsourcing. It includes track on healthcare, energy and environment, and global development, and also includes lots of material that isn't specific to 1 field or industry. It also includes many people and organizations covered on this blog: the X PRIZE Foundation and their partners, Innocentive, Cisco, the Freedom Prize, Changemakers ... and many I've never covered. Here's a sample of the speakers. For the space readers, note that Steve Isakowitz is in the "rumor mill list" of potential next NASA Administrators. THOMAS KALIL - The White House - LUNCH KEYNOTE - The Power of Politics & Prizes - Governments are beginning to revisit the prize incentive model to find new ways to solve major problems within their communities and across borders. Mr. Kalil will discuss the government’s current and future use of prizes as a tool for addressing the grand challenges of the 21st century. STEVE ISAKOWITZ - Chief Financial Officer United States Department of Energy - With massive efforts to revive the economy and address urgent energy policies, the new White House is looking to the Department of Energy to play a central role in kick starting an energy revolution. DR. ANTHONY J. TETHER - Former Director Defense Advanced Research ProjectsAgency (DARPA) - Dr. Tether, Former Director of the Defense Advanced Research Projects Agency (DARPA), headed the DARPA Grand Challenge that led to the development of an autonomous ground vehicle. 35 teams were invited to the National Qualification Event, a rigorous eight-day vehicle testing period. This event was truly groundbreaking because for the first time autonomous vehicles were interacting with both manned and unmanned vehicle traffic in an urban environment. PETER H. DIAMANDIS, M.D. - Chairman & CEO X PRIZE Foundation - Dr. Diamandis will show how the X PRIZE Foundation uses prize philanthropy to drive radical breakthroughs for the benefit of humanity. Dr. Diamandis will share how the $10 Million Ansari X PRIZE drove $100 Million in team expenditures and launched a $1 Billion industry. I usually don't post about the Google Lunar X PRIZE teams announcements, since there are too many for me to keep up with, and by now if you're interested you should know to check there regularly. Every now and then I'll make an exception, though, and now seems like a good time for that. LunaTrex lead company, AirBuoyant announces “VertiScooter”! Competition team updates… - Space Elevator Blog - This has updates from the McGill Space Elevaotr Team and LaserMotive. Space Access 2009 - Who is Going? Long time readers know that each Spring I head to Arizona to attend Space Access 2009. This year I'll again fly with my father. One of my brothers will join us in Phoenix. As for me at Space Prizes, I went the last 2 years, but I doubt I'll go this year, as there's a lot to do at home with a 6-month-old who we've just found out has allergies. Also, the list of speakers at Space Access '09 was updated yesterday. TRUMPF Inc. Tweets from TECMA - Industrial Laser Solutions - TRUMPF Inc.'s profile, launched this week at http://twitter.com/TRUMPFinc, is believed to be a first for social networking in the metal fabricating industry. ... In addition, Doar says that TRUMPF will be atwitter at the upcoming Space Elevator games at Cape Canaveral, Florida, in late April. TRUMPF is one of the event sponsors, and the company's TruDisk technology will be utilized at the competition. Recall the note on the time and place of the 2009 Space Elevator Games being not quite settled yet. Griffith and his staff of 30 engineers believe that wind can play a much bigger role in the energy revolution if they can harness the more powerful winds 1,000 to 3,000 feet up, which contain more energy per square foot than any other renewable source. They are developing wing-shaped kites to do just that. This also includes a video interview and a Make Magazine video tour of Squid Labs (which apparently has the Origin of Species text on a wall, among other things). E85: The Flex-Fuel Challenge - This is a contest, and here's how it works: produce a video, take a photo, or write a song about renewability (and hey- if E85 flex-fuel is part of the story, we wouldn't mind a bit). Maximizing Progress - See, for example, Geoffrey von Maltzahn ~ Top MIT Grad Inventor! on the Lemelson-MIT Student Invention Prize. Marooned - Science Fiction books on Mars - Winners of SF prizes and awards, and contestants in SF contests, appear frequently. Idea Connection - The link is to their list of contests, but there are lots of other resources there on related approaches to innovation like crowdsourcing, open innovation, and so on. Here's the Home Page. The X PRIZE Foundation, an educational nonprofit prize institute that fosters innovation through competition, WellPoint, Inc. (NYSE: WLP), the nation’s largest health benefits company in terms of medical membership and the WellPoint Foundation, one of the largest corporate foundations in the United States, will host an Advisory Committee Summit today in Washington, D.C. to discuss ideas for the development of a Healthcare X PRIZE, as well as viable options for designing an incentivized competition that will tackle these challenges. ... Attending advisory committee members include: Dr. Peter H. Diamandis, Chairman and CEO, X PRIZE Foundation; Chad Pomeroy, Vice President, Consumer Innovation, WellPoint; Bill Bradley, former U.S. Senator; Elizabeth J. Dietz, Partner, Health care, IBM Global Business Services; Dr. Glenn Steele Jr., President and CEO, Geisinger; Dr. Jim Weinstein, Senior Author, "The Dartmouth Atlas of Health Care"; John Doyle, CSO, Ascension Health and Yury Rozenman, Global Head of Marketing, Pharmaceutical Sector, BT Global Services. Progressive Insurance Automotive X PRIZE Media Exposure - From January 1 through December 31, 2008, the Prize received coverage on approximately 150 TV and radio stations across the globe, 100 national and international newspapers and 900 blogs and websites. ... The 2008 coverage equated to approximately 212 million print impressions, 299 million broadcast impressions and 650 million web impressions, totaling more than one billion impressions for the 2008 calendar year. The equivalent ad value was over $7 Million. Registration Closes for the Progressive Automotive X PRIZE - I cannot immediately provide an actual accounting of the number of applications that we received this week. I can say that it easily exceeds 50. Add these applications to the almost 40 Registered Teams that have previously been reviewed and accepted, and you can imagine that we are looking at a very compelling year to come. Not all of the new applicants will be accepted as a Registered Team. However, from the initial reviews, we anticipate having a very strong starting line up as we move to the next phase of the competition. ... After tonight, the competition will begin a transformation. Come Monday morning, our entire focus will change. The work of sharing new ideas and technologies from the Progressive Automotive X PRIZE Registered Teams will begin in earnest. We've Got Mail - I'd guess that the big stack of mail is more teams registering with postmarked entries. FuelOurFutureNow.com at NSTA - Planning on being at the National Science Teachers Association (NSTA) 2009 National Conference on Science Education in New Orleans, March 19-22? This interactive Internet online feature enables you to share your opinion about the agency's greatest missions. Space fans will be able to view a lineup of 64 missions, learn about their goals, and predict which missions fellow exploration fans will vote for during this bracket-style, single elimination tournament. Nothing new... - Space Elevator Blog - This reports that the location and dates for the 2009 Space Elevator Games I mentioned here aren't finalized in spite of the seemingly official notice, and describes what they've done in that direction so far and what the outstanding issues are. There's also a mention of a Space Show appearance by LaserMotive's Jordin Kare. TrueZero is a Lunar Lander Challenge team, so if my count is correct the LLC has a very strong showing of 6 (past and present?) teams at the conference this year. Maybe with so many LLC teams there will be some kind of meeting with X PRIZE Foundation and/or NASA Centennial Challenges representatives? That's what I'd do, at least. In the "other N-Prize contestants" department, as noted here, Kiwi 2 Space was at Space Access '08 and plans to be there for '09. Space tourists might enjoy this tailored approach to the classic flight jumpsuit, one of the winners of a Tokyo-based design contest co-sponsored by Rocketplane Global. Robert Zubrin's new book "How to Live on Mars" also has some fashion advise for those of use who aren't models considering skin-tight space suits.